in this DHS Darbhanga District Recruitment 2018. 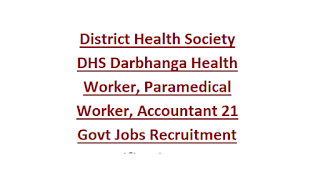 Candidates who are having necessary qualification they can apply for this Darbhanga District Health Society Jobs. Last date to reach application along with all supporting documents for this DHS Darbhanga District PARAMEDICAL WORKER Jobs is 21-05-2018 before closing hours of the day. Candidates selection for this DHS Darbhanga district posts is through merit in educational qualifications. 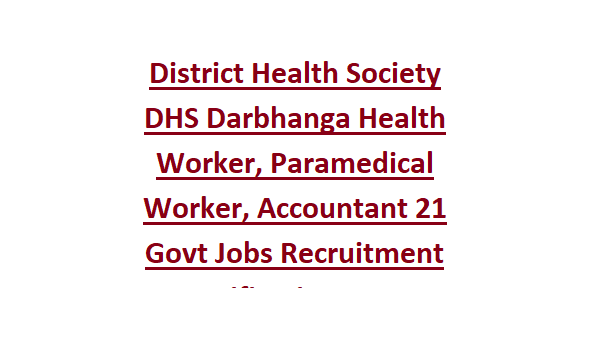 More information about these District Health Society vacancies of Darbhanga District post wise qualifications, selection process, DHS application form and other information is given below. Last date to reach the application to DHS to 21-05-2018 by 05:00 PM. There are total 21 posts in this Recruitment of DHS Darbhanga District. For Health Worker jobs-MBA in Health Management or Hospital Management. For PARAMEDICAL WORKER Jobs-Inter with PMW certificate or MSC/B.Sc with 3 years experience in Health. For Accountant -B.Com Degree with 3 years experience. For general male candidates upper age limit is 37 years. For all others 40 years. Candidate selection will be based on candidates academic marks and work experience for this DHS Darbhanga Recruitment 2018. Candidates who are having required educational qualifications they can download application form from Darbhanga District website. Fill the application form and submit the application form to Member with Civil Surgeon, Secretary, District Health Society, Darbhanga, TBDC Building Allalpatti, Darbhanga 846003 on or before 21-05-2018.